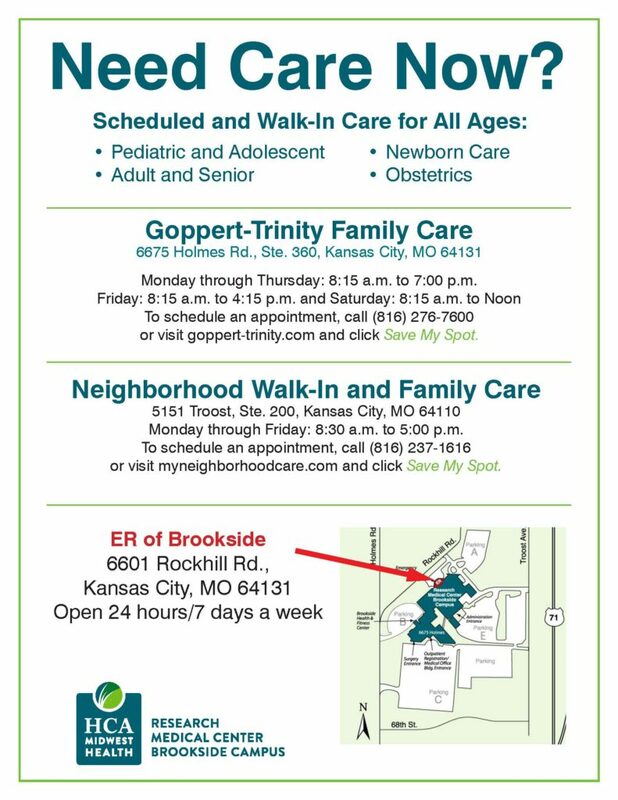 WHEN: Saturday May 11, 2019 from 8 AM – 11 AM. • Only leaves and brush are allowed in the dumpster. • Yard debris must be in a paper lawn bag or a cardboard box. • Tree limbs can be up to 10″ in diameter and 6′ in length. • Please do not place plastic bags or trash in the dumpster. 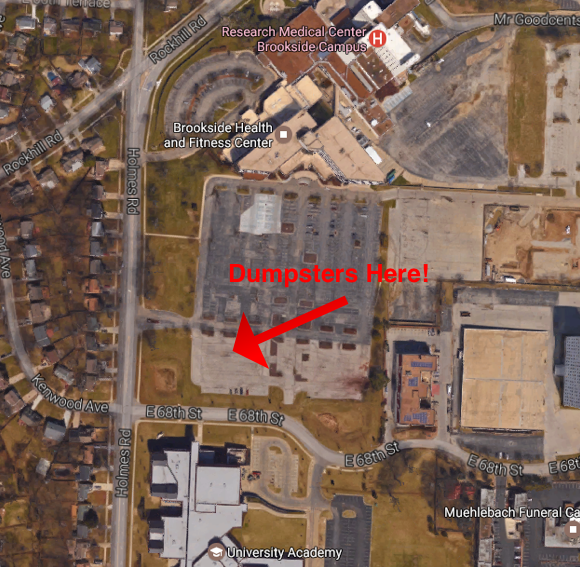 The State of Missouri does not allow leaves and brush in the landfill. • Dumpsters are for common household trash only. • Please do not place leaves and brush, tires, household hazardous waste or appliances in the dumpster. 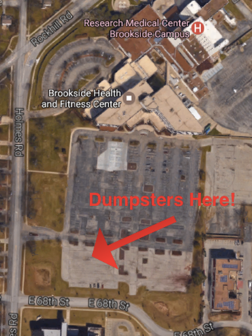 We’d like to thank Research Medical Center for allowing us the use of their parking lot for our Dumpster Day. We are excited to announce the opportunity for our residents to now vote electronically for such things as board members and pressing neighborhood items. 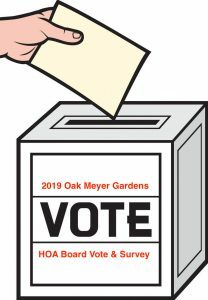 The first vote will be for the 2019 Oak Meyer Gardens HOA Board of Directors. Please review the Bios of the proposed new board members and then click below to go vote! Oak Meyer Gardens is looking for committee volunteers to help improve and beautify our neighborhood. If you, or someone you know, are interested in helping, please consider signing up. Sign up for committees Sunday, November 18 at the Annual Members Meeting. If you are unable to attend, please notify the Board regarding your interest using the “Contact” tab on this website. Be the eyes and ears for interested and energetic volunteers who will be an asset to serve on the Committees and/or the Board of Directors. Prepare the bios and ballots for the candidates for the election of the Board of Directors. Accept volunteers and recommend a slate of nominees to serve as Officers for the Board from those elected to serve. Be the first line of fiduciary responsibility for the neighborhood. Assist the Treasurer in providing oversight of the budget and observe that the income and principal are used in accordance with the objectives of the Corporation. Assist the Committees in acquiring bids for contractors as required for Corporation responsibilities. Maintain a list of delinquent membership dues and recommend a course of action to the Board for acquiring them. Be responsible for the visual symbol of the health and vitality of our neighborhood – the monuments and markers. Recommend to the Board a design for plantings around the neighborhood markers. Assist the Finance Committee in providing bids and recommendations for a landscaper to maintain the plantings around the monuments and markers, and coordinate with the landscaper throughout the year. Recommend a multi-year plan and a budget for maintaining and/or replacing the monuments and markers in a design that is historically appropriate for the age of the neighborhood. Be the lifeblood of the health of the neighborhood by planning and communicating activities and services that help make us a strong and caring community. Among many, these include Dumpster Days, Leaf Pickup, the Summer Picnic, the Ice Cream Social, and the Annual Meeting. Re-establish the Block Captain program so each street has a representative to provide feedback to and from the Board and Committees, and to make sure that all neighbors are aware of events and services. Update the Oak Meyer Gardens Website and make it a one-stop source for a calendar of events and information for the neighborhood. Recommend and plan other means of communication that promote or better our neighborhood, such as a quarterly newsletter, new neighbor welcome baskets, communication banners or light pole banners. On August 19th, the Members voted unanimously to approve a new set of Bylaws. This is the first time the Bylaws have been updated since 1927, when Nichols Investment Company established the neighborhood. We hope that, as well as providing better guidance for the Board, these Bylaws will make it easier for all Members to participate. Thank you to all who participated. Our great neighborhood has been around for over 90 years at this point and our original homes association bylaws are still in place today. 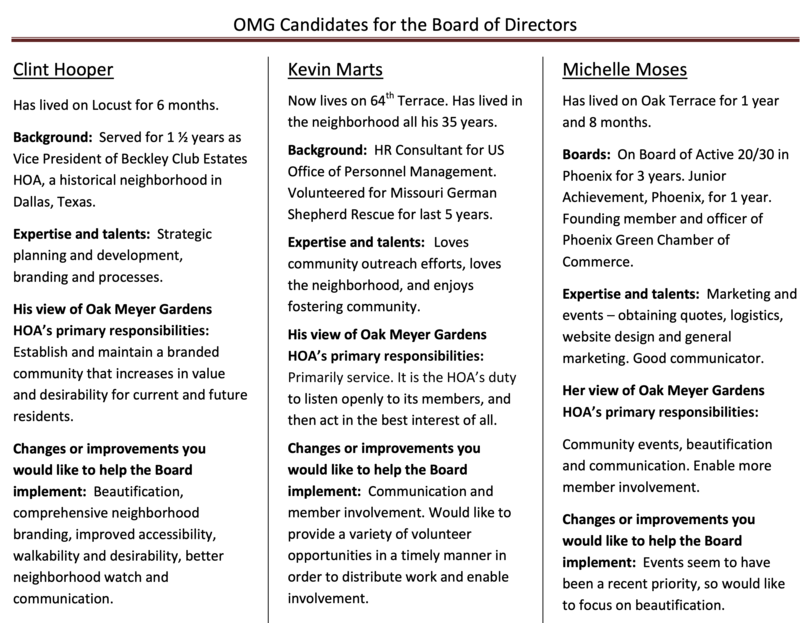 Over the last 6 months a dedicated group of OMG residents have selflessly given their time working as a committee and with local attorney’s to update these bylaws and bring our neighborhood’s governing documents current to where they should be in 2018 and hopefully for another 50 or more years. Below are some notes from the committee on the proposed changes to the bylaws as well as a PDF copy that can be downloaded and reviewed. If you have any questions about the proposed bylaws changes you can contact Valerie Schroer directly at valerieschroer@gmail.com. 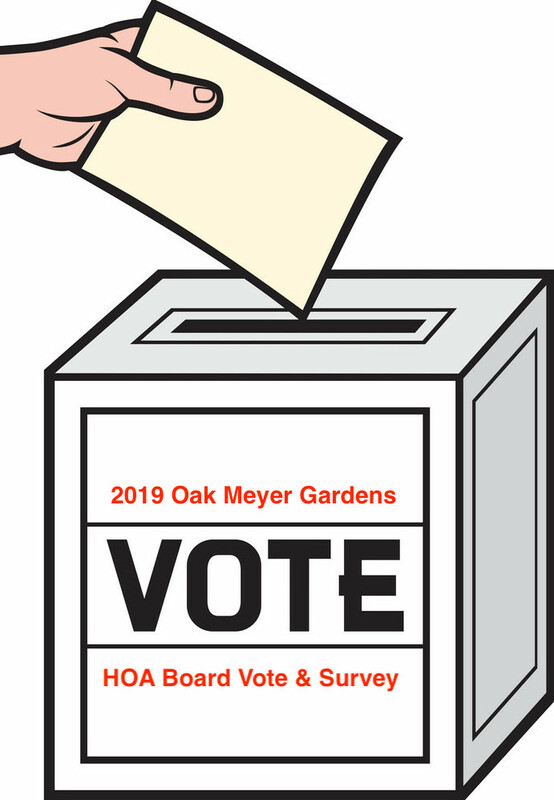 The committee has worked hard on this and we are proud to present the proposed updates and changes to the Oak Meyer Gardens HOA Bylaws below. The Purpose of the bylaws is to provide guidelines for how the Corporation – or Association – should be operated. We think the original bylaws were established in 1938, when the homeowners at that time took over the responsibility of the association from J.C. Nichols Investment Company. Since then, the neighborhood has grown in population and in homes. With this update, we hope to provide more detail to the guidelines. We also hope to include the ability to use electronic means for voting in the future, as well as to make it easier for Members to participate. Article I merely provides definitions for terms used within this document. Article II defines the requirements for membership and Member responsibilities. Again, very little change. Article III describes the requirements for the Board of Directors. It changes the board membership from 5 to 7, to fit the size of the HOA more appropriately. It describes the process for adding to or removing Board Members. Article IV changes little. It describes the Powers and Duties of the Board of Directors. Article V provides more detail for describing the duties of the Officers. It describes how to replace an officer who can no longer serve. Most importantly, this article clarifies the rights of members to have access to copies of official HOA documents and outlines how to get them. Article VI – Committees. One of the major reasons for updating the bylaws is to make it easier for Members to become involved and make for a stronger community. One way of doing this is to form committees to distribute the work of the Board Members. It is recommended that Board Members serve on the committees to help bring institutional memory to each committee, and to help the committee members form their annual goals. But it is also hoped that the committees will form task forces for each of their goals and distribute the work even further. The four committees recommended to be formed are the Finance Committee, the Communications and Activities Committee, the Beautification Committee, and the Nominating Committee. The responsibilities of the Finance Committee will be to assist the Treasurer in the preparation of the annual budget, and in the seeking of bids for contractor expenses. The Communications and Activities Committee will be responsible for maintaining the Corporation’s website and social media platforms, planning and managing all special events, and such things as marketing and any development activities that may occur. The Beautification Committee will be tasked with maintaining the monuments and markers throughout the HOA as well as the plantings. The Nominating Committee will seek out qualified nominees to serve as Directors of the Board and place the nominees before the Members. More details of these responsibilities may be found in Article VI of the proposed bylaws. Article VII. This article formalizes the requirements of the annual meeting, what should be included, and how it should be run. The bylaws venture out here to change how we vote for Board Members from voice vote to written ballot. (See more in Article X.) This article adds requirements for calling special meetings, and describes how Members can initiate an action by having a topic placed on the agenda of a Board Meeting. This article also formally includes electronics to allow Board Members to participate in meetings using digital communication. Article VIII adds an indemnification clause to protect the officers and directors from expenses and liabilities in connection with certain legal proceedings with the exception when one has been found guilty of misfeasance or malfeasance in performance of duties. Article IX adds several paragraphs to protect the Corporation from a director acting in his or her own interest over that of the Corporation. Article X – Voting. This is a big change. Again, we are hoping to get more members involved. Voting for Board Members will start several weeks before the annual Members’ meeting with ballots and information mailed out on each willing nominee. Only one vote is allowed per lot owned. This is the existing rule now as well. Ballots may be mailed in by a certain date or be brought to the meeting where they will be formally tallied and the results announced. The Board of Directors will decide who the officers will be for the following year. Finally, we are introducing the possibility of electronic voting for Members. We hope to establish this after a secure but simple method for doing so is researched and found. Articles XI. No change here. This merely describes how the bylaws can be amended. Article XII states that in case of any conflict, the Declaration of the Homes Association shall prevail over the bylaws. The Declaration is original to when the HOA was founded in 1927. A copy of it, along with the Restrictions, the original bylaws, and the proposed new bylaws may be found on the Oak Meyer Gardens website at oakmeyergardens.org. The Oak Meyer Gardens Beautification Committee (OMG BC) (Geoff Hall, Sarah Snodgrass, Jill Adams, Bill Blanck, andd I) are gearing up for spring and wanted to provide you with an update on where we stand. 1. In lieu of a neighborhood-wide meeting, we would like to request comments, suggestions, ideas from the HOA regarding the gardens/monuments via email and have those responses sent to the OMG BC gmail account (OMG.BC.KCMO@gmail.com). Please provide your thoughts regarding the gardens by Friday, March 23th, 2018, 11:59 PM. 2. Our first step will be to catalog each garden’s location and contents; this will be accomplished by mid-March. Although someone had done this years ago, those records/files, no longer exist. If any of you happen to have a copy of that list, please do share with the OMG BC to avoid a lot of needless work. 3. If you would like to become a member of the Committee, please indicate that via email to OMG.BC.KCMO@gmail.com. 4. If you live close to one of our gardens and would like to be a point person (or persons) for that garden and a liaison to the OMG BC, please contact the OMG BC via email with your name(s) and the precise location of the garden for which you are volunteering your time. It would be IDEAL if we could find folks interested in helping out in this way! 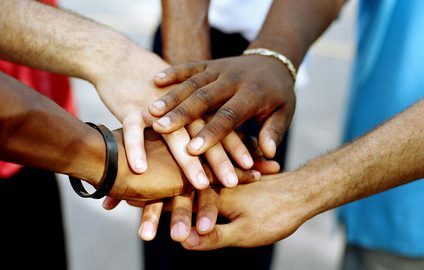 Working together will be much more effective and fun than having a handful of us on the Committee doing this alone. Rumor has it that there are 61 gardens which need our attention…take if from someone who took care of ~70 gardens herself for 2 summers, this is easily enough work for a full-time job! 5. The committee will meet by the beginning of April and strategize our approach for renovation of the gardens over the spring/summer 2018 and will provide the HOA with an update shortly thereafter.